A breakaway group from Fiji's Methodist Church, have formed their own church. Appropriately called the New Methodist Church, it was founded by former Air Pacific employee, Atu Vulaono. 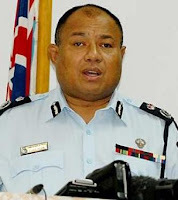 He is the brother of Police Commissioner, Esala Teleni. Sources say Teleni is a staunch and leading member of the Church and gives regular sermons. Since last December, Teleni has ordered non-Christian police men and police women to attend church with their families. A month ago, the Crusade was held at Nasova grounds for residents of the Nasova Police Barracks. It's said families were told to attend the Crusade for more than three hours. Sources also say last Friday, the New Methodist Church, which is based in Nasese, was filled with non-Christian police officers. At the service, Teleni moved around preaching and blessing officers, many of them Indians. Sources who were present, say he touched their foreheads with such force, they nearly lost their balance. Coupfourpointfive has been told there are fears that non-Christians in the police force, will have to convert to Christianity, in order to keep their jobs. He could pray for his sins first after breaking the law by assisting with throwing out the supreme law of the land. What inconsistency? On the one hand they break the law and on the other, they preach about God! That's funny... why the "new"? ... sounds just like the old one to me. Blah, if only he'd do something to actually reduce the bloody crime rate in this country other than praying about it. Oh, I forget, he's not actually a cop and doesn't have a single clue what law enforcement is all about. But then again, Fiji doesn't have much in the way of laws anymore so why bother with enforcing anything. I'll give him this, not much chance of his church suffering a break-in with all those cops forced to hang around it. This is an act of a cover up or a sign of desprado!! If he wants God to answer he's prayers then he needs to get himself right with the people of this nation first! " GOD RESIST THE PROUD BUT WILL GIVE GRACE TO THE HUMBLE" So humble yourself Leweni and make yourself right with the people of Fiji ,the ones you have abused and hurt so badly by your bad and selfish desicion making. Sounds more like the Muslim rushing down from the North into the sub continent and giving Indians a choice of the Koran or the sword many years ago! The 4th comment was meant to be for TELENI . Please stop mocking the LORD!! Very scary !! big time scary!! more life threatning than the "swine-flu"
He's a lost person who's confused between rights and wrong. Just showing what human brains so damaged by power hungry ended up doing when piled too much on his plate. He should seriously consider cleaning head and removing the cork thats making his eyes cross.